A structured cabling system (SCS) is a set of cabling and connectivity products that integrates the voice, data, video, and various management systems of a building (such as safety alarms, security access, energy systems, etc.) over a choice of media. This media could be shielded or unshielded Twisted pair (STP/UTP) in copper, single mode (SM) or multi-mode (MM) in fibre cables. Structured Cabling system is the foundation and the basic requirement on which all other network equipment depends. An SCS consists of an open architecture, standardized media and layout, standard connection interfaces, adherence to international standards, and total system design and installation. 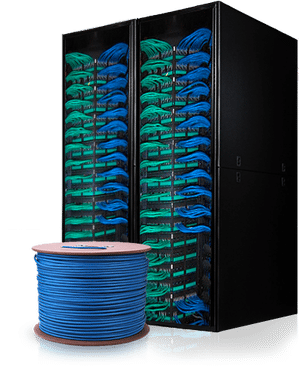 Other than the structured cabling system, voice, data, video, and building management systems have nothing in common except similar transmission characteristics (analogue or digital data signals) and delivery methods (conduit, cable tray, raceway, etc.) that support and protect the cabling investment. TIA/EIA 607: Commercial Building Grounding and Bonding requirements for the Telecommunication Industry. Today’s cabling plant has to support “tomorrow’s requirement”. Changes and upgrades have to be easy and flexible. Often Structured Cabling is neglected but it is mission critical where change control is a must. Structured Cabling systems don’t break but they often get out of control because of the negligence. When we look at the IT Investment, cabling will be around 5 per cent and we expect it to last for the next 15 to 20 years and support all the future applications. Since applications are dependent on the quality of the network, one recommends the deployment of Structured Cabling as a system that is procured from a leader in the industry with vast experience in the connector and cable market with reliable and good quality products. Deployed as an end-to-end solution, it should ensure consistency in performance and delivery of bandwidth to meet tomorrows convergence networks requirements. While working with a network installer one must ensure that he is vendor certified/trained engineer and offers an effective network solution that is easy to implement and support. While many vendors offer a variety of warranties today, ensure that your network is not just certified for components but also for performance. Optical Fibre: An important characteristic of fibre optics is refraction. Refraction is the characteristic of a material to either pass or reflect light. When light passes through a medium, it “bends” as it passes from one medium to the other. Fibre-Optics use light pulses to transmit information down the fibre and the light pulses move easily down the fibre-optic line because of a principle known as total internal reflection. “This principle of total internal reflection states that when the angle of incidence exceeds a critical value, light cannot get out of the glass; instead, the light bounces back in ” When this principle is applied to the construction of the fibre-optic strand, it is possible to transmit information down fibre lines in the form of light pulses. There are generally five elements that make up the construction of a fibre-optic strand, or cable: the optic core, optic cladding, a buffer material, a strength material and the outer jacket. The optic core is the light carrying element at the centre of the optical fibre. It is commonly made from a combination of silica and Germania. Surrounding the core is the optic cladding made of pure silica. It is this combination that makes the principle of total internal reflection possible. The difference in materials used in the making of the core and the cladding creates an extremely reflective surface at the point in which they interface. Light pulses entering the fibre core reflect off the core/cladding interface and thus remain within the core as they move down the line. Single Mode: Single-mode cable accepts only one mode of light – the axial mode and supports best at 1310 and 1500 nanometre wavelength. The single-mode cables are the most important cables for long-haul use (carrier and Internet core). The cable has a small core (8 to 10 microns) that forces the light to follow a more linear single path down the cable, as opposed to the multipath reflections of multimode cable. This cable has the highest bandwidths and distance ratings. The core diameter for single-mode cable is typically 8 to 10 microns with a cladding diameter of 125 microns. Multimode: Multimode cable accepts many modes of light and supports best at 850 and 1300 nanometre wavelength. This cable has a relatively large diameter core (50 to 100 microns) and a total diameter of 125 microns. Step-index multimode cable has an abrupt change between core and cladding while graded-index multimode cables have a gradual change between core and cladding. For example, the minimum recommended cable type for FDDI (Fibre Distributed Data Interface) is 62.5/125-micron multimode fibre-optic cable. That means the core is 62.5 microns and the core with surrounding cladding is a total of 125 microns.The core specifications for step-index and graded-index multimode cables are typically 50 and 62.5, whereas the cladding diameter for step-mode cable is 125 microns. Within multimode there are four varieties (OM1, OM2, OM3 and OM4), which is the most popular in the enterprise Networks, an OM1 (62.5 micron), OM2 (50 micron) fibres are becoming obsolete in the industry because of the large bandwidth requirements, where its replaced with OM3 and OM4 (50 micron Laser Optimized Fibres) which could support high Effective Modal Bandwidth of 2000 and 4700 MHz-km respectively and these fibres would also support for the upcoming 40/100G requirements. But this fix still has distance limitations. Twisted Pair: Twisted pair cable consists of a pair of insulated wires twisted together. It is a cable type used for telecommunication purpose. Cable twisting helps to reduce noise pickup from outside sources and crosstalk on multi-pair cables. Twisted pair cable is good for transferring balanced differential signals. The advantages of improved signal-to-noise ratio, crosstalk, and ground bounce that balanced signal transmission bring in wide bandwidth. By transmitting signals along with a 180 degree out-of-phase complement, emissions and ground currents are theoretically canceled. This eases the requirements on the ground and shield compared to single ended transmission and results in improved EMI performance. Shielded TP: Cables with a shield are called shielded twisted pair and have copper media, commonly abbreviated STP. The degree of reduction in noise interference is determined specifically by the number of turns per foot. Increasing the number of turns per foot reduces the noise interference. To further improve noise rejection, a foil or wire braid “shield” is woven around the twisted pairs. This shield can be woven around individual pairs or around a multi-pair conductor (several pairs). Unshielded TP: Cables without a shield are called Unshielded twisted pair and is the Copper media, which is being used for increasingly higher data rates, and is the de facto standard for horizontal wiring. UTP is a very flexible, low cost media, and can be used for either voice or data communications. Its greatest disadvantage is the limited bandwidth, which restricts long distance transmission with low error rates. A Twisted Pair is a pair of copper wires, twisted together and wrapped with a plastic coating. The twisting increases the electrical noise immunity, and reduces the bit error rate (BER) of the data transmission. Intelligent Cabling Systems: Intelligent cabling system is a solution which will provide complete up to date accurate documentation in real-time by which enabling customers to minimize costly network failures and downtimes, integrates network layer and physical layer management, features integration into facility management tools, reduce staff workload, and more importantly reduce the time for moves, adds and changes by automating the management of the physical layer. By improving the process of moves, adds and changes, reduces the cost associated.